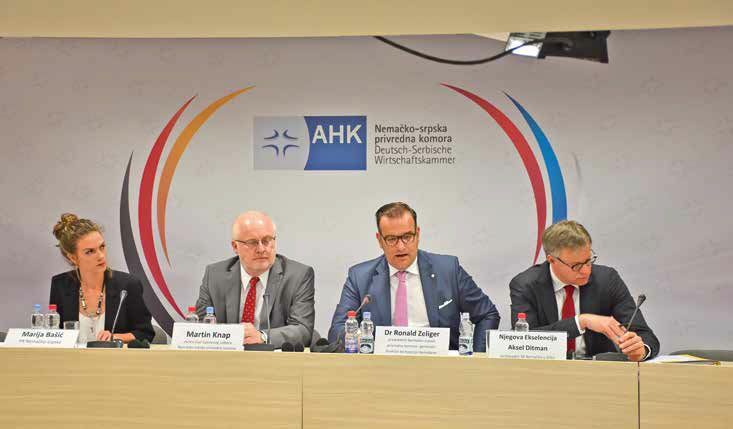 Since the founding of the then Delegation of the German Economy in Serbia and the German-Serbian Economic Association in 2001 until the official establishment of the Chamber on April 14th, 2016, AHK Serbia represents the interests of member companies, provides information support to their business, and advocates the development and improvement of the German- Serbian trade and cooperation in all economic aspects. One of the tasks of the largest bilateral chamber in Serbia is advisory support to German companies when entering the Serbian market, as well as support to Serbian business people when entering the German market. For the 13th consecutive time, the German-Serbian Chamber of Commerce (AHK Serbia) conducted a study on the economic environment in Serbia among its member companies. 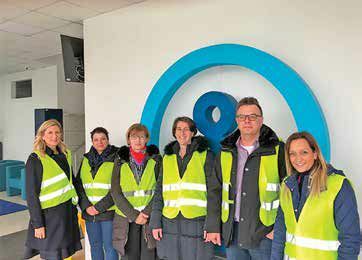 German and Serbian companies, members of the German Serbian Chamber of Commerce, positively assessed the economic climate in Serbia, expressed positive expectations regarding their own business and their satisfaction with the labour market. Also, 85% of the surveyed companies would invest in Serbia again. As in previous years, the survey participants underlined the need for a more intensive fight against corruption, as well as bolstering legal safety and transparency in public procurement. At present, there are close to four hundred German companies with more than 45,000 employees operating in Serbia, which undoubtedly indicates that Germany is one of the most important and most reliable economic partners of Serbia. The German industry, as one of the leading economic powers in the world, has overcome a number of challenges over time thanks to a well-trained workforce and a dual education system that has been implemented in Germany for nearly a century. That’s why AHK Serbia is investing efforts to educate and better inform business people about their responsibilities in the process of introducing dual education in Serbia. According to the new Law on Vocational Training in Serbia, which comes into force in September 2019, the development of a digital instrument for accreditation of training companies is a very important element in guaranteeing consistently high quality in the vocational education system in Serbia. After numerous discussions and working meetings, together with the Austrian Chamber of Commerce, the Serbian Chamber of Commerce, the Ministry of Education and Economy, as well as representatives of vocational schools, it was finally time to solve this issue. Accreditation indicators and relevant guidelines as a source of information for companies, developed under the guidance of our colleague from AHK Serbia, Oliver Herrlen, were made available as the final version in mid-December 2018. All participants unanimously agreed they had established a significant and balanced instrument for quality assurance in the field of “Dual VET Serbia”. However, no tests were done in realistic situations. After a short survey, Kühne und Nagel has kindly opened its doors to some twenty people and allowed them to check new instruments. After testing, minor corrections were made, which means that the instruments and described guidelines were finally ready for use from mid-January 2019. Companies that want to enter the new dual system called Worked-Based Learning and apply for accreditation in the Serbian Chamber of Commerce can rely on consultations and numerous services provided by AHK Serbia. 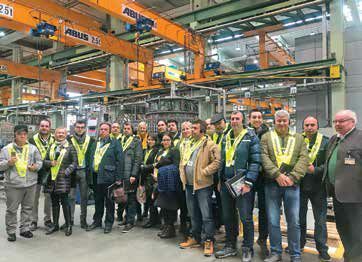 Within the framework of the export initiative projects of on the topic of energy efficiency and renewable energy sources, and under the auspices of the German Ministry of Economy and Energy, AHK Serbia organized a trip for a business delegation from Germany with a focus on biomass and biogas that lasted from 19th to 23rd March, 2018. 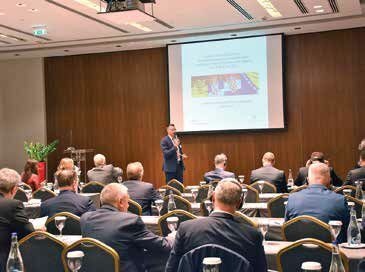 An expert conference “Biomass and Biogas” was organized as a part of this project, at which seven German companies presented their services and the know-how to numerous Serbian companies and institutions. In cooperation with Bayern International, and under the auspices of the Bavarian Ministry of Economy, the German Serbian Chamber of Commerce organized business trips focused on specific sectors, with the goal of establishing business contacts, exchanging the know-how and experiences between business enterprises, educating participants, as well as developing the business cooperation between Bavarian and Serbian companies and institutions. In 2018, AHK Serbia organized two events under the BFP program: a study tour to Bavaria dedicated to hydro energy with a focus on small hydropower plants and to milk and dairy industry, organized together with the Delegation of the German Economy in Macedonia. 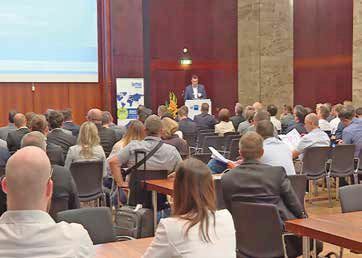 The fourth regional B2B project was held on June 19th, 2018 in Frankfurt, organized by the German-Serbian Chamber of Commerce, the representatives of the German economy in the countries of the Western Balkans (AHK) and the German Association for Supply Chain Management, Procurement and Logistics (BME eV), with the aim of helping German companies find manufacturers from the required economic branches in Serbia and the Western Balkan countries. The companies that took part were predominantly from the metal processing sector, the automotive industry, the plastics processing sector and the manufacturing sector, as well as the electrical and electronics companies. The Prime Minister of the German Federal State of Baden-Württemberg, Mr. Winfried Kretschmann, visited Serbia as a member of the delegation of high officials and representatives of German companies from that federal province from 16th to 20th April, 2018. 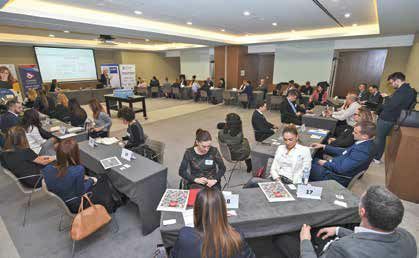 On April 17th, 2018, AHK Serbia organized numerous B2B meetings between German and Serbian companies. Political, economic and social perspectives in the Western Balkan countries were regional topics covered by the conference that was organized by the German-Serbian Chamber of Commerce (AHK Serbia) in cooperation with the Committee of the German Committee on Eastern European Economic Relations (OA), that took place on 26th and 27th September, 2018, under the title Western Balkans 2030 – Visions. Wishes. Realities. in Belgrade. State Secretary at the Ministry of Trade, Stevan Nikčević, the German Ambassador to Serbia, H.E. Mr. Thomas Schieb, President of the German-Serbian Chamber of Commerce, Dr. Ronald Seeliger, and the Chairman of the Working Group of the German Committee on Eastern European Economic Relations (OA), Janusz Kulik, opened the two-day conference in Belgrade. The conference participants talked about how Europe and the Western Balkan countries would look like in 2030, how the Western Balkan countries implemented their European integration process, the effects of the Berlin Process, social, political and digital transformation, and other interesting topics. Business dinner for representatives of member companies is one of the most popular events organized by AHK. The honorary speaker from the local economic and political scene opens an event with a short presentation on one of the current topics, followed by a discussion and a cocktail party in a relaxed atmosphere. During 2018, AHK Serbia had the honour to host the famous writer, journalist, translator and diplomat, Mr. Ivan Ivanji, who was a guest speaker on the topic “An Extra on the Big Stage”. The German-Serbian Chamber of Commerce organizes working groups which focus on three areas: human resources, communications and public relations, and energy efficiency and renewable energy sources. At the interesting interactive meetings between the members, which had 35 participants on average, the members present common topics with presentations of experts from the given fields and exchange their experiences with their peers from different companies. 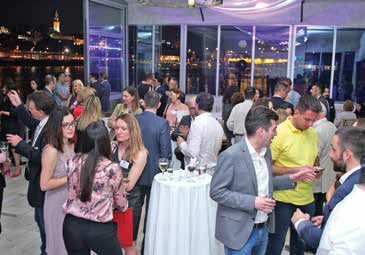 Speed business meetings are interesting events which AHK Serbia organizes for its members in collaboration with other chambers of commerce and business associations in Serbia. Through a unique concept of short B2B meetings, members meet with representatives of member companies from different organizations, establish and strengthen business relationships and initiate potential collaboration. 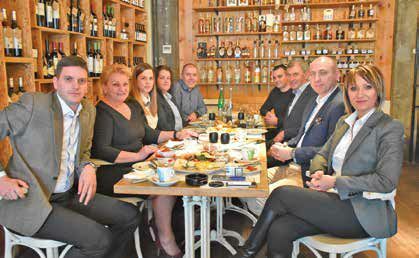 AHK Serbia holds a welcome breakfast for all newcomers. At a brief presentation Deputy Director, Doris Danilović, usually presents the work and services to the new members, namely the activities and events that the Chamber organizes, the benefits derived from the membership, as well as the possibilities of promotion and support in the business. After the presentation, the participants will get acquainted with the newcomers at a joint informal breakfast. In cooperation with its members, AHK Serbia organizes numerous seminars and workshops on current topics. Additional education and provision of information enable employees in member companies to improve their existing knowledge, get acquainted with the novelties in their line of business and thus improve their companies’ operations. In this way, the members/co-organizers of the seminars are given the opportunity to promote the company’s values and their own competencies. AHK FOOTBALL TOURNAMENT WE ARE NURTURING THE SPIRIT OF SPORT! The AHK Serbia football tournament is a great opportunity for both team-building and competing in sports amidst the strong competition of teams from member companies. Socializing between the players and those who come to cheer, as well as having a lot of fun are all integral parts of the tournament. At the traditional AHK summer party held in the pleasant ambience of the Brener restaurant, the guests, members of the companies, members of the diplomatic corps and numerous partners and friends of the Chamber enjoyed the performance of the famous Belgrade band Stubovi Pop Kulture, cocktails and delicious meals. 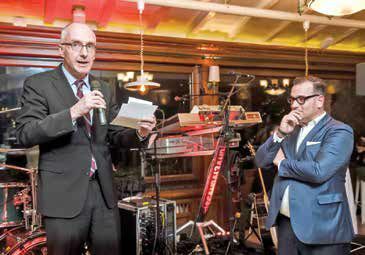 The German-Serbian Chamber of Commerce nurtures a 200-year-old German tradition by holding the AHK Oktoberfest each year. 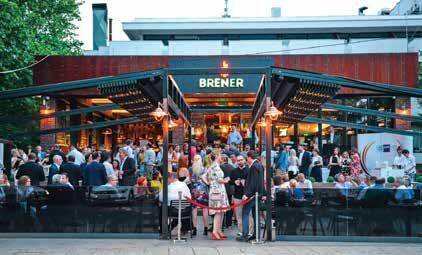 The 9th Oktoberfest in Belgrade, and the third that was organized by AHK Serbia, was held on 4th and 5th October, 2018. Around 1,300 guests from company members, partners and business execu-tives enjoyed Erdinger Beer, diverse Bavarian cuisine and music by Dejan Petrović and his Big Band, as well as competitions in mug-holding and beer drinking. The 3rd AHK Oktoberfest was organized with the support of many sponsors that are the Chamber members, and this year it also had a humanitarian character. The guests donated money to the Zvončica Association of Parents of Children with Malignant and Other Rare Diseases. 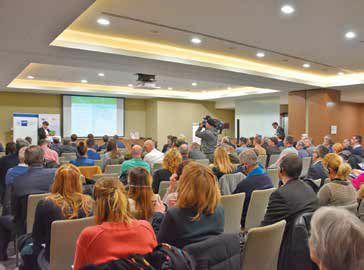 The fourth multi-congress Serbian Visions was held during 24th and 25th November, at the Old Mill, a Radisson collection hotel. This traditional event presents a sort of platform for organizations and companies dedicated to creating a better future for the country, society and economy in Serbia. This year, 60 different two-hour events attracted about 3,000 visitors. Participants of Serbian Visions presented their organizations, projects, ideas, visions, themes and solutions that they advocate. At the opening ceremony of the fourth multi-congress, plaques were awarder fot the second consecutive time – the plaque for the best vision was given to the educational organization of the civil society Belgrade Open School, while the plaque for the best social engagement was given to an organization engaged in promoting safe, active and healthy lifestyle for senior citizens called Stari Grad 50+. In cooperation with the German-Serbian Chamber of Commerce, the Belgian-Serbian Business Association, the French Serbian Chamber of Commerce, the Hellenic Business Association of Serbia, the Croatian Business Club, the Japanese Business Alliance, the Canadian Business Club, the Italian- Serbian Chamber of Commerce, the Nordic Business Alliance, the Slovenian Business Club and the Swiss-Serbian Chamber of Commerce, a big event was organized on 24th May, 2018, at which the members of AHK Serbia had the opportunity to meet the members and the business community from other chambers in one place and in a relaxed atmosphere. The goal of such an event was to provide our members with a better platform for networking and exchange of experiences, as well as to improve the business environment. At our traditional Christmas celebration, we gather members, associates and friends to sum up our impressions of the passing year together and round off the annual operative cycle. AHK’s Christmas celebration is an informal gathering of guests in an elegant ambience and festive atmosphere.